There is, of course, no excuse for this mess. A hint to the audience’s insurrection actually arrived some 17 years ago with the Cluetrain Manifesto, a declaration of the sweeping social and commercial revolution the web was spawning. 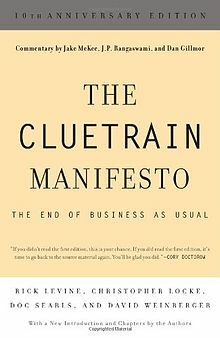 Cluetrain’s authors thought they were stating the obvious, but their manifesto and subsequent book created a sensation. The manifesto set forth 95 theses – new rules of digital media and the new audiences being collected by the Internet. This was one of the first of an uncountable number of warnings issued over time to the media industry, including the ad business. It was 2001 when Yoram Wind, a globally known marketing expert, first wrote about the rise of “empowered and skeptical” audiences online. Wind, known to everyone as Jerry, is the senior Wharton professor and consultant to industry who founded and leads the Wharton Future of Advertising Program. The rest of the media business has been struggling longer to cope with the consequences of advancing audience control. Half the newspaper business has disappeared because the audience learned to curate its own news online. The music business failed to sell music in the form the audience wanted; digital streaming took over by allowing people to compile personalized playlists, one song at a time. The wake-up calls keep arriving. But the backers of traditional ad-supported TV, the lifeblood of the old ad industry, seem to remain holdouts, firmly believing TV spots are largely immune to the consequences of audience control. They remind me of climate-change deniers on a hot winter day. During a keynoter at CES, NBCUniversal CEO Steve Burke called advertising without TV spots “unthinkable,” Advertising Age reports. Burke added, “People are going to want to watch great television on a great television set.” Yes, Steve, but that doesn’t mean they’ll much longer tolerate having the great experience continually interrupted by Viagra, Geico, and even stupider advertisers. The latest news is that ad-supported TV and arbitrary bundles of paid programming on cable are under heavy assault from the web. To make up for falling ratings and rates, both cable and broadcast increased ad time per hour. Now the audience is forcing a retreat to fewer ads. The revolution is being led by Netflix, Amazon, and the like, all of which give people what they want: Complete control. No interruptions. No stupid TV spots. No ads at all, in fact. The news media business got theirs. Then the music business; the book business. Now it’s advertising’s turn. As everyone with any sense is saying, the time is past due to put the audience first. That may sound easy; it isn’t. It means that it’s far more important to find out what really matters to the audience than it is to ask a client what message it wants to deliver. Ad blockers exist because too many clients and agencies want to deliver too many messages that don’t matter to a single real person. If you want to serve your clients, you must be a ferocious advocate for their audiences. 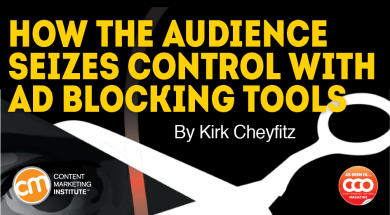 The Internet uncorked the genie of audience control. It is never going back in the bottle. It’s time to deliver really valuable experiences to “empowered and skeptical” audiences. It’s time for compelling stories, honest information, standing for something more than the next sale and being something more than a series of product claims. Welcome, as I always say these days, to the Post-Advertising Age. “The use of ad blockers has more than tripled over the past three years to 181 million users today and the growth rate is torrential. Think about it. People hate ads so much they’re willing to go to the trouble of downloading a chunk of software just so they can escape them. That’s a bad position to be in. “Here’s a thought: Don’t hijack my screen (desktop, mobile, and otherwise) with unwanted come-ons in windows that require the dexterity of a mohel or a diamond cutter to close. It’s lazy and you’re just engendering ill will. The trick is to give me something I want or might like. Don’t rely on lazy ad banners and inane TV spots. Add value to my life. Tell me something I should know or would enjoy hearing about. In exchange I’ll grant you my interest – until you get boring or ask me for money like a subway panhandler. If you publish an article that is like real journalism, warts and all, that reveals something intriguing about the world, I might even buy your thingamajig. “First, you need a powerful insight into a core part of your audiences’ lives – a struggle, a joy, or a fear. Next, you must portray it so vividly and truthfully that people see themselves in the portrayal and react emotionally. That strong emotional tension needs a fix or release. And this is the most important part: deliver the solution in a way that is interesting, useful and timely. “My concern long-term is more with what I call ‘mental ad blocking.’ This comes from the continual dependence by marketers and their agencies on a mental model of advertising called ‘interrupt and repeat.’ This was the model that emerged with the rise of paid advertising in mass media, particularly radio and television in the 20th century. “The cluttered, interrupting nature of this model, both online and offline, together with the poor quality of most ads, pushes consumers into ‘mental ad blocking.’ I worry this can lead to a loss of respect and trust for brands across all possible platforms. Advertising as a service. Brand communication that helps customers solve problems, improve their daily lives, help others improve their lives and learn new things is being used more and more because it has goals beyond exposure and transaction only. Storytelling. Topics and experiences that matter to customers are integrated (or connected) in the brand stories in meaningful ways. Disclosure: Cheyfitz is a member of the Global Advisory Board of Wharton’s Future of Advertising Program. This article originally appeared in the April issue of Chief Content Officer. Sign up to receive your free subscription to our bimonthly print magazine.